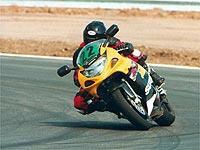 A new season of dates for the California Superbike School racetrack training school. California Superbike School dates start on April 5 with a two-day camp at the world-famous Jerez circuit in Southern Spain. UK courses start at Silverstone on April 22, with a further 19 dates at either Silverstone or Brands Hatch, until the last date on September 12. School Director Andy Ibbott said: “The skills we teach work for all types of rider and the skills they gain they have for life and let’s be brutally honest, a rider who can improve his riding skills reduces the risks to himself and others”. Dates for additional courses at Mondello Park in the Republic of Ireland will be announced shortly and courses are also available in Spain, Czech Republic, Sweden, Greece, South Africa, Dubai and Bulgaria. The full schedule will be published online at www.superbikeschool.co.uk. Developed by Keith Code, who coached Wayne Rainey in the 1980’s, the California Superbike School opened its UK operation in 1996 and BSB Champion Leon Camier is the latest in a long line of racers to prove the value of the School’s methods. Each student is assigned a personal qualified Riding Coach for the day and has five technical classroom sessions each followed by a 20-minute on-track session to put the theory into practice. Prices start at £379 and the courses are open to anyone with a full motorcycle licence or recognised race licence. Riders can bring their own bike or there is the option to hire a Yamaha R6 with the latest Dunlop rubber. Alpinestars two-piece leathers are also available to hire. Full details of dates and locations can be found on the California Superbike School website.